Knox was converted through the effort of Thomas Guillaume. He first heard and was influenced by the sermons of George Wishart in 1545. Wishart, a fellow Scot, had been on the Continent until he returned to Scotland in 1543. Knox worked with Wishart until he was arrested, convicted of heresy for his Protestant teaching, and burned at the stake in 1546. Knox was well-known to be a colleague of Wishart so when Cardinal Beaton was murdered—the cleric who ordered Wishart’s execution, the situation became unsettling for Knox. He found refuge in the Castle of St. Andrews where he continued in relative freedom until French galleys entered St. Andrews Bay, laid siege to the castle, and breached the wall resulting in the surrender of the inhabitants. Knox and some of the others were condemned to row in one of the galleys. Prisoner Knox survived nineteen months of brutal existence as a galley slave and was released in 1549. The year 1549 was one of optimism for Protestants in England because, with the death of Henry VIII, his nine-year-old son Edward VI became king and brought with his accession hope that the Reformation teaching from his tutors would result in a truly Protestant kingdom. Knox went to England and was soon appointed to serve a congregation in Berwick-upon-Tweed, then he served one in Newcastle and then some other churches. He also was one of the chaplains for King Edward VI. Young King Edward’s reforming rule ended with his passing on July 6, 1553, resulting in the accession of Roman Catholic Queen Mary. Mary’s accession made it advisable for any Reformation leader to leave England, which included Knox. Refugee Knox stopped briefly in Dieppe on the French coast of the English Channel northwest of Paris until he traveled to Geneva to join other exiles seeking the teaching of John Calvin. He did not stay long initially because he received a call from the English congregation in Frankfurt am Main in Germany. Reluctantly, he consented to the call with the encouragement of Calvin, but his ministry was short-lived due to conflict in the church. He returned to Geneva and on into 1559, Knox learned from Calvin in conjunction with his ministry to the English refugee congregation. During Knox’s sojourn by scenic Lake Geneva he published in 1558, The First Blast of the Trumpet Against the Monstrous Regiment of Women. The use of Monstrous Regiment does not mean women marching in formation as troops armed to the teeth in a war against men, the words instead refer to what Knox described as “unnatural rule.” The Blast contended that women rulers were contrary to Scripture and natural law. The tract was offensive to many, including John Calvin, and was particularly odious to Catholic Queen Mary of England and Catholic Mary Guise of Scotland. When Protestant Elizabeth became queen in 1558, Knox showed no favors to her Reformation sympathies but instead wrote a defense of Blast specifically directed to her attention. Needless to say, John Knox was not one of Queen Elizabeth’s favorite people. With the accession of Elizabeth most of’ Knox’s English congregation left Switzerland to return to their home, however Knox could not join them because Elizabeth’s hatred of him resulting from Blast led to his exclusion from the land. Instead, he sailed directly to Scotland where he continued to be a vocal leader in the movement for reform. John Knox was the minister of St. Giles in Edinburgh from 1560 to 1572. As was common during the Reformation, the ornaments, decorations, and altars of Catholicism were removed and a substantial pulpit was installed symbolic of the centrality of the preached Word for worship. He not only ministered at St. Giles but was also involved in the greater Church of Scotland with one of his most important contributions being the First Buke of Discipline, 1560, which governed worship and order. 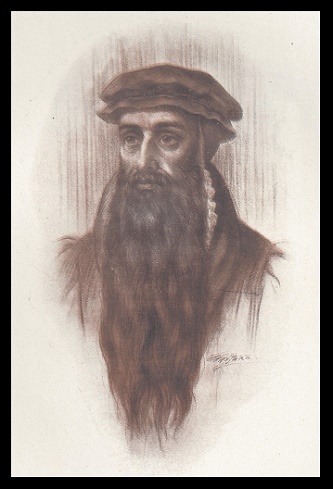 John Knox suffered a stroke in July 1570 which affected at least one of his arms because he referred in his writings to his “dead hand.” He was able to minister on an irregular basis until he chose to leave Edinburgh for St. Andrews to convalesce as he likely anticipated his passing. However, he returned to Edinburgh in August 1572 after receiving a letter from a group of congregants requesting his return so “that once again his voice might be heard among them.” He died on November 24th. He had been married twice, first to Marjory Bowes, and the second time to Margaret Stewart Ochiltree. Two sons from Marjory, along with Margaret and three daughters survived him. Like Calvin, the preacher of St. Giles was buried without a marker, which explains the approximation of the location of his remains under space twenty-three in the parking lot covered churchyard.